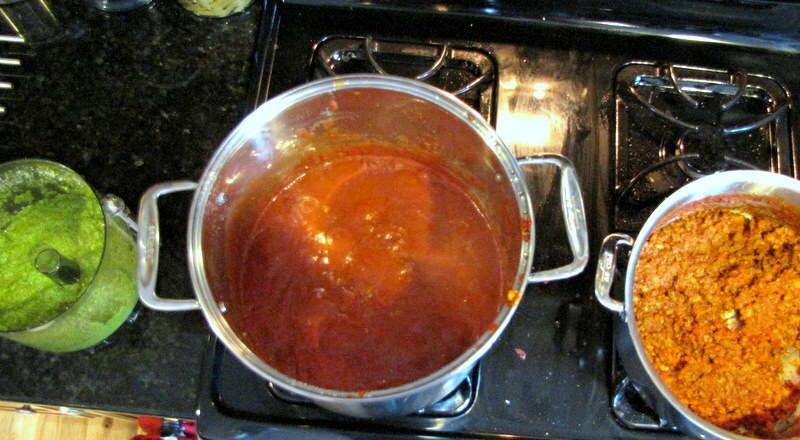 Pesto (recipe for that to come), my tomato sauce, and bolognese (recipe for that also to come). I’m hot and I smell like a trattoria, but it was well worth it. We have cleaners who come in once a month, and they’re here now. I knew this would be a messy enterprise, I wanted to get it all done before they got here so I don’t ruin all their hard work tomorrow. The only downside is, I was also going to try my hand at making homemade pasta, but I ran out of time. I guess I’ll try that tomorrow, but I’ll have to lay a tarp down or something. I try to hold off making too huge a mess in the kitchen for at least a couple of days after it’s been nice and scrubbed.